The 1st In Russia WT Towers Production Launched In Taganrog. WRS Bashni, LLC has invested 772 million rubles to establishing a plant for the production of wind turbine towers. The products of new Taganrog enterprise will be operating at wind farms in the Rostov Oblast; the launch is scheduled for 2020. Significant part of the towers produced in Taganrog are planned to go for export. The WRS Bashni plant was built in Taganrog as part of the state programme for the development of renewable energy and the creation of a new high-tech power engineering sector. The majority owner of WRS Bashni, LLC is the Spanish wind turbine towers manufacturer Windar Renovables, which owns 51% in the Company’s authorized capital. The remaining part is equally divided between Rusnano, JSC, the state corporation, and Severstal, PJSC. The joint venture will be the first production of the wind turbine towers in Russia. The construction of the WRS Bashni operating department in Taganrog lasted for eight months, said Pyotr Spiridonov (Петр Спиридонов), the company’s CEO, during the ceremonial launch of the plant. Estimated output is 100 three-, four-section towers per year. Mass of each of them will be 190 tons, height will reach about 85 meters, diameter – 4.3 meters. In total, the company is to manufacture more than 600 towers by the end of 2023. The return of production to operating surplus is scheduled for 2019. The total amount of investments in the project amounted to 772 million rubles, of which 549 million were meant for the purchase of industrial equipment, the principal supplier of which was one of the largest players in the global wind energy market, the Denmark-based Vestas A/S. “This is the third company in Russia, which was established with the participation of Vestas,” – the company’s vice-president David Rowan (Дэвид Роуэн) noted. “In Ulyanovsk, we took part in the creation of the wind turbine blades production, and the gondolas – in Nizhny Novgorod. The Russian Vestas A/S subsidiary, Vestas Rus, LLC (the member of the RAWI) will also be one of the key customers of the newly emerged enterprise; the company has provided reassurance of the purchase of towers to build wind farms with a total capacity of 750 MW. The Danish electricity generator now controls facilities with a total capacity of about 1 GW, located throughout the world. According to WRS Bashni, Siemens Gamesa (the member of the RAWI) (a joint venture of the Siemens, the German concern, and Gamesa, the Spanish manufacturer of wind turbines), as well as the Moscow-based Vetroenergetika MC, LLC (equally owned by the Rusnano and Fortum, PJSC), the company signed a memorandum with the Government of the Rostov Oblast in December 2017 to build three wind farms in the region by the end of 2020, which will be located in Krasnosulinsky and Kamensky districts; their total capacity will be 300 MW. The total number of the wind turbines in the wind farms will reach 78; the amount of investment in the project will be about 70 billion rubles. Last year, based on the results of a tender conducted by the state, the companies that would build wind farms with a total capacity of 400 MW in the Rostov Oblast by 2022 were selected. This is about 5% of the existing capacity in the region. Italy-based Enel, the Finnish Fortum and the Russian Rosatom companies are among the investors. “Since 2017, there are 3 major investment projects in this sector that are being carried out in the Rostov Oblast with a total investment of up to 85 billion rubles,” – the Governor of the Rostov Oblast, Vasily Golubev announced during the opening ceremony of a new plant. “A happy combination of projects in the wind power engineering sector has developed in the Rostov Oblast, the launch of which will lead the region to the Russian leaders in this segment and the production of necessary equipment,” –Anatoly Chubais, Chairman of the Rusnano Board, said. 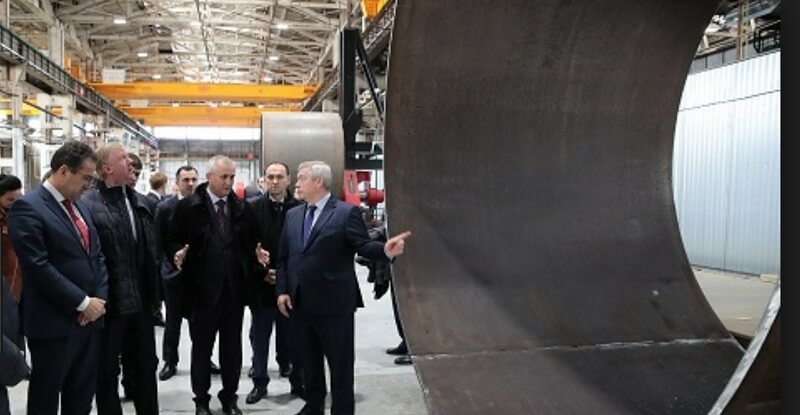 “The wind farms of the Rostov Oblast will be the first in Russia to be equipped with the turbines mounted on towers of domestic manufacture, the same goes for the blades and gondolas. As representatives of the state-owned corporation say, about 85% of the wind turbines global market is now controlled by about 15 major manufacturers from Europe, the USA and Southeast Asia. The production of towers in Taganrog will have its own competitive edges over other global manufacturers, and, in particular, among the markets of the CIS-countries. ⟵Ветропарк АО “НоваВинд” в Адыгее.